Packaging Options | American Animal Health, Inc.
Shut-eye Patches come in two sizes the cow size (regular) and a smaller size for calf. Each shuteye kit (box) contains 10 patches and 1 tube of glue. These come packed 10 to a case, and our larger shipper will hold 6 cases. 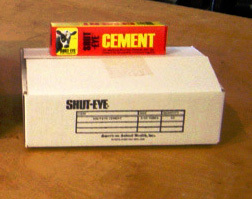 Shut-eye individual glue is packed 12 to a case. Shuteye Patch for Pinkeye Cattle Disease is a canvas patch that is glued on over the eye to protect the eye from sunlight, rain, wind, dust, grasses, and insects. The patch will fall off in 7 to 10 days thus it is environmentally friendly. 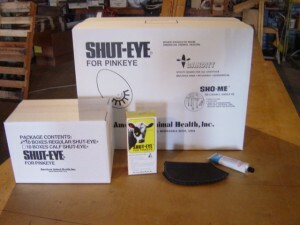 Shuteye Patches for Pinkeye Cattle Disease are packed 10 patches to a box with one tube of glue. There are 10 boxes in a case. The dimensions for 1 case of Shuteye Patches are 13.5" wide, 9.25" height, 8.5" depth, and weight 8 pounds(Calf) and 10 pounds (Cow). The dimensions for 1 case of glue are 12.4" wide, 3.4" height, 7.75" depth and weights 5 pounds. The large shipper holds 6 cases (each case holds 10 box kits) and its dimensions are 20" high 26" wide and 14"deep and weighs 46 pounds (Calf) and 59 pounds (Cow).